I'm going to state the obvious...I haven't blogged in a really long time. I missed you, I really did. And talking about cupcakes and chocolate. You see, we got a panini maker. That was the start of the problem. Dinner was just too easy. Two slices of bread, a slice of cheddar, two slices of turkey...voila! A hot dinner, no dirty dishes, no work, no blog. So after a month of eating panini's (I do not exaggerate, we have gone through a lot of bread, cheese and meat), I decided it was time for a hot dinner. And since my favorite holiday was approaching, a Cinco De Mayo party was an easy choice! This party is what my beautiful fiestaware were made for! I was happy to see them so happy. I'm not gonna lie, I like details. For me, that is (half) the fun have throwing a party. And then there is the food...MEXICAN food! 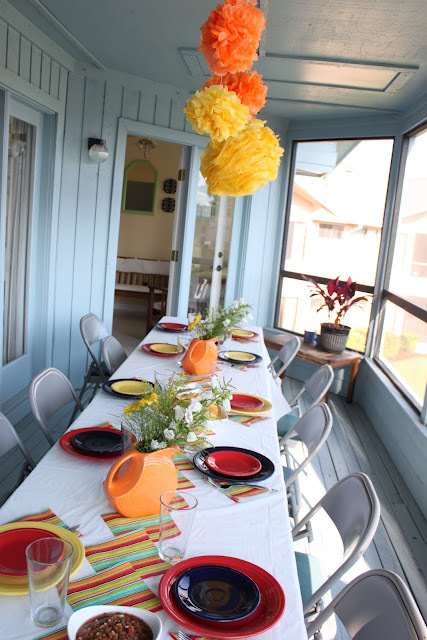 Oh my goodness, you can't go wrong throwing a dinner party on Cinco De Mayo. Fool proof. If I had to choose one food to live on the rest of my life (besides chocolate) it would be chips and salsa. And the great thing about this salsa is that it is soooooo easy! In a food processor chop onions and cilantro. Pour the 2 cans of tomatoes (and extra green chiles) into a blender, whiz for a couple seconds. Combine all ingredients and salt to taste! Refrigerate for a couple hours. This salsa is best fresh. It doesn't last more than a couple days. Use fire roasted diced tomatoes instead of regular ones. Make sure to use white onion, it has more flavor than vidalia etc. And begin your salsa with fresh diced jalapenos added to the processor. The amount should be varied to ones taste for heat.Also add the juice of a 1/2 a lime, or whole depending on size.